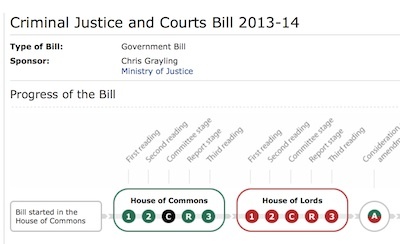 The House of Commons Public Bill Committee on the Criminal Justice and Courts Bill 2013-14 is currently in operation. I have made the following submission following the: Public Bill Committees – guidance on submitting written evidence. Submission from Richard Taylor, an individual writing in a personal capacity. I would like to make a submission in relation to two elements of the Criminal Justice and Courts Bill 2013-14; firstly on openness and transparency of the court system, addressed in paragraphs 1-9 below; and secondly on the proposed provisions relating to juries, addressed in paragraphs 10-15. I hope the Government will bring new provisions describing the mechanisms to ensure transparency which the minister promised to the committee. If the new provisions are not proactively submitted I hope the committee will press the Government for them, or failing that committee members will propose their own. Currently there is no effective public access to full court lists, providing details of upcoming cases, or of court registers, containing details of court decisions. While the doors to the courts are open and anyone can walk in and observe, without proactive publication of information on the court’s activities proceedings are being effectively held in secret as it is very hard to find out when cases of interest are scheduled. I think it would be bizarre and inconsistent to introduce mechanisms to ensure proactive publication of court lists and registers for cases to be heard under the proposed “Trial by single justice on the papers” provisions, but not to make the lists and registers information similarly available for those cases heard in court. I am aware at least one MP is under the impression magistrates courts lists and registers are already published (http://www.rtaylor.co.uk/5890#comment-77508) so I think it’s worth clarifying they are not. Only very limited information is published on noticeboards in courts, essentially a list of defendants names along with the court number and an indication of when the case is to be heard. Access to the full list, even for inspection in person at court, appears arbitrary, I have on a number of occasions been refused access to a copy. Some elements of the proposed Criminal Procedure Rules amendments, and the justification for their rejection, appear out of touch with modern technology. The idea of publishing material online for two business days would surely be rendered irrelevant as search engines, archiving organisations, newspapers and others will be able to obtain, store, and re-publish the information. The argument that giving people access to information online inevitably creates a security risk in relation to other information held by an organisation is also nonsense. Does a newspaper publishing articles on a website make its internal IT systems more vulnerable? The culture, and technology, within our courts system will need time to adapt to a more open and transparent way of working. I would suggest the Bill ought allow an period of time for the transition to proactive publication of court lists and registers, but this shouldn’t prevent legislating for an open and transparent courts system now. I am concerned by the general tone and impression given by clauses 40-44 of the Bill. The courts are already an intimidating place for jurors. I think justice, and our society, is best served by jurors who feel empowered, and who can be focused on fulfilling their role to the best of their ability and who will not be overly concerned about committing a criminal offence or a contempt of court. I am concerned that jurors required to surrender electronic communications devices could be prevented from contacting their friends, families, employers and others while on jury service; particularly if that service involves the jury being sent to stay at a hotel. I think the proposed law gives too great a power over juries to the courts. I would like to see jurors where possible given notice of an intent to issue an order to surrender electronic communications devices so jurors could have the opportunity to leave them at home, or in their cars, for example. I’m concerned that clause 42 “Research by jurors” is too broad. Making it an offence for a juror to research the law, or court procedure could make it illegal for a juror to even read up on the new laws introduced by the Bill, describing what conduct is and is not permissible. A juror who goes online to read official information about jury service, perhaps seeking to re-watch the introductory video, to find out about arrangements which apply to expenses, illness, etc. or to find out if a judge was within his powers to order the confiscation of their mobile phone, could find themselves committing an offence. Jurors might legitimately wish to consider looking up aspects of court procedure, which may not be covered in material provided by the courts. A juror experiencing a judge asking a member of the jury to stand up and declare the defendant guilty, with no deliberation after a late guilty plea might want to research to see if that action was appropriate and permissible. A juror finding themselves on a jury considering jury nullification (an option which jurors may not be proactively be made aware of by the judge and court staff) may reasonably want to research to what extent a jury has to follow directions from the judge. Jurors may gain more confidence to challenge court staff, or the judge, in relation to a ruling if they are able to check their understanding of the law, and court procedure, by researching the matter before raising the matter via a jury note. I want jurors to feel able to question proceedings; and feel confident in raising concerns with the judge via court staff. Where a juror has acted in the public interest, or in the interests of justice, I think that ought be a defence to those offences for jurors introduced by the Bill. In all but the most egregious cases where jurors have behaved recklessly and irresponsibly I suggest the worst that ought happen to a juror is they get taken off jury service. This entry was tagged Courts, Justice on March 24, 2014 by Richard Taylor. Andy Slaughter MP states at 16:31 that the government is being a bit heavy handed towards jurors, and says jurors need to be treated as adults. He adds that taking away electronic devices rather than restricting their use is against the grain of that trust. If I could just slightly disagree with the Hon. Gentleman because I think there is a concern about whether jurors think there is so much risk of imprisonment if they do something slightly wrong in one way or another that people may be dissuaded from serving on a jury. I think it it is very important there are controls like this but that they are very clearly exceptional. I hope we will keep the attorney general’s consent to make sure people are not driven away from serving on a jury. I think that’s a slightly odd point because people don’t have a choice as to if to serve on a jury or not (even if a certain class of people perhaps think jury service is optional because they think they can run rings around court officers charged with running the system; resulting in the often quoted adage that if you are tried by a jury you’re tried by a panel of people not smart enough to get out of jury service). Andy Slaughter MP responding to Julian Huppert’s comment stated at 16:51:56 that a representative of the Law Commission stated the proposals went too far, and suggested an amendment to the definition of prohibited conduct. Andy Slaughter said, at 16:54:30 it was important for jurors to be independent, for them not to be cowed, for them to feel they can make decisions robustly. The single magistrate will have access to legal advice, a clerk, or whatever assistance they may need. MPs on the Bill committee appeared to accept the minister’s promise and didn’t seek to amend the Bill to require access to a clerk / legal advisor. (13) Following a paper procedure the court must publish the outcome.’. This would only apply to a cases dealt with by a single magistrate, alone, in private. Amendment 44 would require case lists to be published, both of cases that will be considered by a single justice and of decisions reached by a single justice. The effect would be to lay down in primary legislation something that we believe is best left to criminal procedure rules and to general practice. we will have mechanisms in place to ensure that the public have access to court decisions. I do not intend to press amendment 44, although I wish that the Government would give further consideration to publicising the proceedings before and after the event, in particular because, as we discovered earlier, such matters could be heard almost anywhere and at almost any time. At the moment, it is rare for journalists to be in magistrates courts; the media cannot afford that, unless there is some very serious offence of huge public importance. Local press do not have the resources to have reporters sitting through cases of this kind. My view is few people observe cases in courts because it’s so hard to find out about cases of interest. If full court lists were published in full I think more people would observe cases, and more cases would be publicised. There’s no need for a professional journalist to be in court, anyone present publicise proceedings. I thank the minister for giving way on that point. Will he when looking at some of those procedures have look at the evidence submitted by my constituent Richard Taylor who makes a number of suggestions based on his own experience on how that could be addressed, could he at least have a look at the submission that was sent to this committee, I don’t expect a detailed response now. The Committee has decided that witnesses can themselves publish or otherwise make use of their own evidence. I can’t see why that can’t be the default position, and why each committee has to make such a decision. Where such decisions are made I think they need to be publicised so that those making, or considering making, submissions, are made aware of them. In relation to point 3, Courtserve provide court lists electronically for various courts. If you register with them as a member of the media you should get access to County Court lists for free electronically on their website. They also produce electronic lists for Crown Courts, Royal Courts of Justice and Employment Tribunals but I’m not if these are free to access or not. Were these the types of courts you wanted access to the lists for or was it mainly the Magistrate’s Courts lists? If they provide the lists electronically to Courtserve, is there a law that means the government has to provide such lists electronically to anyone else who might ask or does Courtserve have a contract meaning they get exclusive access to court lists?